I will preface this by saying these are my own thoughts on Elizabeth Gaskell’s North and South, so I urge you to comment if you agree/disagree with them. Before delving in the novel, I just want to quickly summarise what was going on in Britain at the time that Gaskell was writing. With the industrial revolution, Britain moved from an agrarian society, to a factory based industry. This transition brought upon many political and social changes for Britain: the formation of the working class and industrial middle class, poor labour conditions in the factories, increase in child labour, poverty, Chartism etc. Although I won’t discuss the industrialisation of Britain in detail, this isn’t a history lesson after all, it is important to understand the context out of which a new genre of the novel emerged (if you are really interested in this subject, you should look at the works of Frederich Engels, John Ruskin, William Morris and Thomas Carlyle, who greatly influenced the writers of this period). The 1830s and 40s gave way to the industrial novel. Also referred to as social problem novels, these works tried to represent the effects of industrialisation and depict the conditions of the working class. Popular novels of this genre include Charles Kingsley’s Alton Locke (1849), Charles Dickens’ Hard Times (1854), Benjamin Disraeli’s Sybil (1845), and of course, Elizabeth Gaskell’s Mary Barton (1848) and North and South (1855). 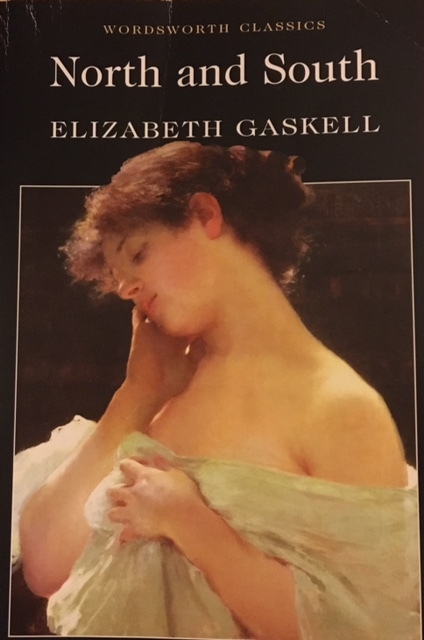 Now, unless you are in the field of English Literature, or have watched BBC’s 4 part adaptation of North and South, chances are you have never heard of Gaskell, or her works. This is due to two reasons: firstly, she has only recently been included in the literary canon (due to the 1970s revival of works by women writers, Gaskell is now recognised as an important literary figure), and secondly, many choose to discuss the works of the aforementioned authors instead. In her lifetime, Gaskell published many successful novels, among them Mary Barton (1848), Cranford (1851), and Ruth (1853). She and her husband were very well known in Victorian England, and their social circle included many important figures, including, Charles Dickens (actually, a number of her novels were published in Dickens’ journal, Household Words), John Ruskin, and Charlotte Bronte (Gaskell was also responsible for writing the first biography of Bronte—The Life of Charlotte Bronte, published in 1857). If you are interested to learn more about the life and career of Elizabeth Gaskell, I suggest taking a look at Jenny Uglow’s Elizabeth Gaskell: A Habit of Stories, and Hilary M. Schor’s Scheherezade in the Marketplace: Elizabeth Gaskell and the Victorian Novel. Now I must admit, I am a huge fan of Gaskell—so much so that I dedicated a full chapter of my thesis to her works. With that said, you can understand why I was very excited to be teaching North and South for my classes. Having just re-read the novel, and discussed it with my students, it is a perfect choice for my first literary instalment. For those who are not familiar with the novel, the story follows Margaret Hale (a middle class woman, and daughter of a pastor) as she moves away from the agricultural town of Helstone (in the South), to Milton, an industrial city in the North of England. For simplicity’s sake, we can break down the novel into two important plots: the love story between Margaret and John Thornton (a factory owner in Milton), and with that the reconciliation of North and South, as well as the relationship between the workers and their masters. There are also a few side stories that make their way into the main narrative: Mr. Hale’s decision to leave the Church is the sole reason why the move from South to North takes place, Margaret’s brother Frederick is wanted for mutiny, and Mrs. Hale suffers and eventually dies from an illness. First things first, everyone in my classes loved North and South—I have never had such a positive reaction towards a novel before, 100% serious. They enjoyed the love story, they found the representation of the working class, through the Higgins family and Boucher, to be insightful, and they loved Gaskell’s literary style. That said, they were also quick to point out problems with the novel, most of which I agreed with. I really enjoyed Margaret’s wilful character, and overall character development. At the outset of the novel, Margaret is portrayed as a shy, naive young woman—think about her reaction to Captain Lennox’s proposal: “Margaret felt guilty and ashamed of having grown so much into a woman as to be thought of in marriage,” versus the indignation evident in the way she responds to Thornton’s proposal. By the end of the novel we come to appreciate and value her strength, and most of all, her masculine agency. She is a true heroine—outspoken, passionate, ambitious, independent, but at the same time, kind, loving, and caring. (My students were also quick to point out that Margaret’s character is a stark contrast to that of Fanny Price in Austen’s Mansfield Park—obviously, they preferred Margaret). Also, did anyone pay attention to the number of people that die in her social circle? Bessy Higgins, Mr and Mrs Hale, Mr Bell, all die, and yet, Margaret is unwavering in her strength and composure (except in a minor incident where she collapses following her encounter with the policeman). As readers, we are instantly sympathetic towards the workers, especially with the plight of Bessy Higgins. Gaskell might not have been part of the working class, BUT she does try to portray their struggles as accurately as she can. However, we should acknowledge that some of her depictions are problematic. On the one hand she draws our sympathy for the working class through Bessy and Nicholas Higgins, yet, at the same time, criticises the working class for not knowing their place—I’m thinking of the episode where Margaret censures Dixon: “‘Dixon! you forget to whom you are speaking.’” However, I do feel like Gaskell could have done more. The narrative of Mary Barton is far more comprehensive, in the sense that we get a greater glimpse of working class lives and the conditions in the factories. At the same time, Gaskell’s representation of middle & upper class women through Edith Shaw-Lennox and Fanny Thornton, are very enjoyable. How can you not chuckle with the way Fanny reacts to the mob: “The women gathered round the windows, fascinated to look on the scene which terrified them. Mrs. Thornton, the women-servants, Margaret,—all were there. Fanny had returned, screaming up-stairs as if pursued at every step, and had thrown herself in hysterical sobbing on the sofa” (such a drama queen). If you can even call it a resolution? Did anyone feel like Gaskell glossed over all major issues? Yes, Higgins and Thornton form a friendship which symbolises the union of the workers and masters, BUT it’s too easy—especially because in reality, there were no important reforms for workers until 1867? I get that Gaskell was pressed for time, but surely she could have added a bit more than just a few paragraphs in the penultimate chapter of the book. A number of students mentioned that the story line reminded them of Charlotte Bronte’s Jane Eyre (1847): Margaret Hale marries John Thornton only when she has acquired money and he has become a relic of his former self; similarly, Jane marries Rochester after she comes into money, and after Rochester becomes handicapped. Seeing as Gaskell and Bronte were good friends, it is very possible that Bronte’s work influenced North and South. Keeping in mind that Gaskell was unhappy with the ending, partly because she felt rushed due to Dickens’ strict schedule deadlines, the union of Thornton and Margaret feels massively incomplete. Throughout the novel, we do get a sense of underlying sexual chemistry between the protagonists, BUT we never experience the typical love story development. What I mean by this is that Margaret spends the majority of the novel “hating” Thornton. The only time we see Margaret contemplating feelings for Thornton is after the mob scene where she saves him; and even then, when Thornton asks for her hand in marriage, she dismisses his proposal, calls his actions “blasphemous,” and even goes so far as to remark that she is deeply “offended” by his manner. On the other hand, we are constantly reminded how much Thornton loves Margaret (anyone remember how intently he looks at her bracelet falling down her wrist, or how he is consumed with whether or not she gives him her hand?). Thornton’s love for Margaret is very obvious; Margaret’s, however, is debatable. This is why the ending feels abrupt and rushed. Their relationship doesn’t have a chance to develop, and we are left wanting more. The most significant problem I have with the ending is the same problem I have with the ending in Jane Eyre. Here are two very strong, independent, characters, who consistently display their disdain for marriage, and yet, marry at the very end. And while in Jane Eyre we do get a sense of the love between Rochester and Jane (so in a way I can understand their union), we don’t feel this passion in Margaret’s and Thornton’s relationship. Then again, I have a problem with all novels that end in marriage, as if that is the only way in which characters can attain happiness and self-fulfilment (that’s as much as I am going to say on that topic because I promise you, I could write pages and pages on this). Overall, although I do have issues with parts of the novel, I am not trying to discourage anyone from reading it. Quite the opposite really- I hope that you all have a chance to read it, because it really is a great text. And if you are a fan of Jane Austen, trust me, you will love Gaskell.